The tremolo technique: how to improve it? The tremolo is a beautiful techniques of the classical guitar: it gives the impression of flow of notes, a continuous thread of sound. Basically it’s made playing a bass note with the thumb followed by three repeated higher notes, traditionally plucked with the ring (a), middle (m), and index (i) fingers. play the higher notes. 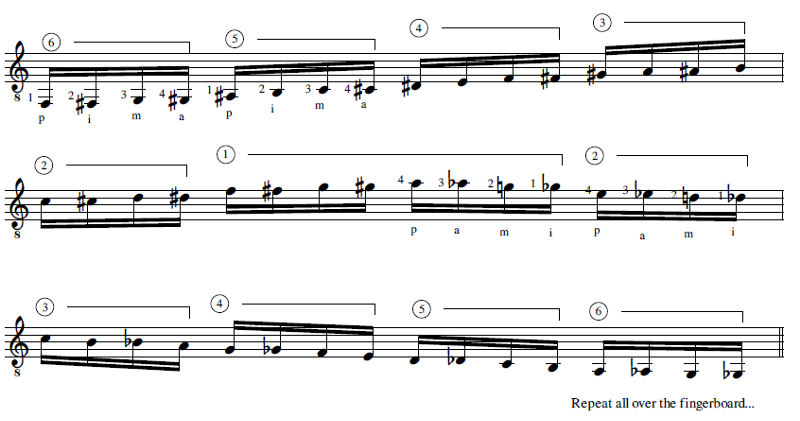 When played rapidly, this technique creates the illusion of a sustained melodic line with a bass accompaniment. Many important composers for the guitar, including Francisco Tárrega, Manuel Ponce, Mario Castelnuovo-Tedesco, Federico Moreno Torroba, Joaquín Rodrigo, Alexandre Tansman, and Agustín Barrios have utilized the tremolo in their works. This technique is said to have developed through the desire to emulate the sustained, singing tone of a violin on an instrument with limited sustain. It is an advanced technique that not all performers can master. Using or not fingernails is a very subjective matter. Recently i started to renovate my technique basing it on a touch without fingernails. It is important for the right hand fingers to be “on” the strings, caressing the strings, and not “flying” or with an exaggerated motion. The tremolo needs to be smooth, fluid like water, like a little stream. The creation of a mellow tone must be emphasized by using more flesh than nail; for this reason, the nails should not be too long. In most tremolo passages in the repertoire, the fingers carry the melody and the thumb plays the accompaniment. Proper balance of volume between the thumb and fingers is an essential element of a good tremolo, therefore it is important to train the thumb to play quietly, and it’s more difficult at fast speeds. [this technique] is developed to emulate the sustained, singing tone of a violin on an instrument with limited sustain. So, an adequate speed of execution is, in my opinion, essential for proper rendering of the effect. For example, another version of Recuerdos de la Alhambra played by Narciso Yepes, places a particular emphasis on execution speed, with results that have generated conflicting opinions in the community of guitarists (like all performance Yepes, however), but which I think perfectly reproduces the the sound idea behind this technique. So, which exercises can help me developing a good tremolo? First: your best ally in the tremolo study is the metronome! The steady pace and run cleaning are basic: it is true that the notes in the tremolo must be perceived as a continuous stream, but it is also true that each note must have its own identity and be able to be heard clearly. And finally, old but gold, let’s study “Recuerdos de la Alhambra”! NextNext post: Tor in a company network: how to detect and block it?